What a great adventure! Very inspiring following these two across the country. This is a great book..very well written. I was fortunate enough to follow the progress of this father/daughter duos journey on their blog while they were making their way from right to left across the US map. Once I heard that they were writing a book about their ride, I knew I had to order it. I think that sometimes the adjective “inspiring” is oftentimes over-used when describing adventures such as this. However, in this case, the adventure of these two was quite literally inspiring to me. The journey of these two INSPIRED me to undertake my very own cross-country solo cycling adventure across the great state of Texas. Google “CycleXTexas” (on twitter as well as www.crazyguyonabike.com) and read about my adventure that was literally inspired by Mike and Jocelyn’s journey! 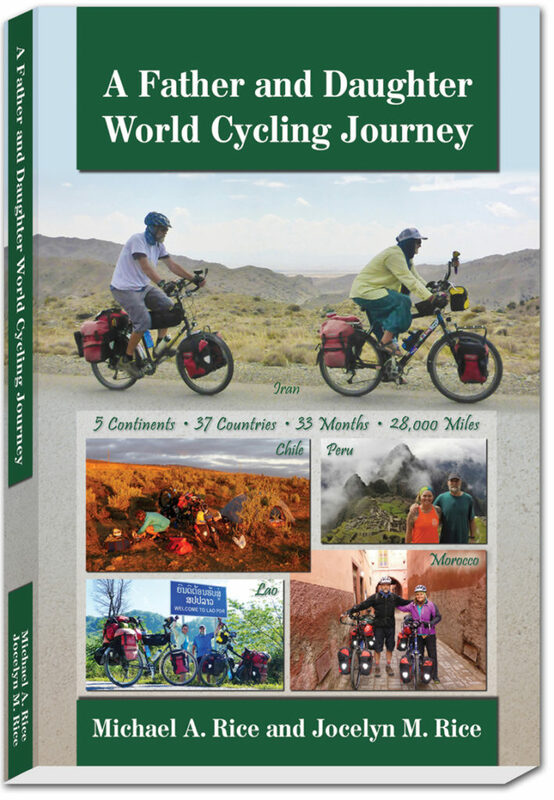 This book is a must-read for cyclists, adventurers and even couch potatoes! Click above and buy this book, read it….and then put on your helmet and cycling shoes and get out there and find your own journey! Oh my goodness! What a book! I couldn’t put it down. I can’t say that I was with you while you were riding, but the book is great. It was so well-written. Anyone who reads it will feel as if they are in the seat with both of you. They will feel all emotions in the world. They will laugh, cry, and pant with each difficult peddle. The suspense of whether that “Beast” would make it or not also kept you wanting to read. I sat down last night and went from Florida to Arizona in one night. I will probably finish it within the next two nights. Each chapter you read makes you want to read another. What a read. This is a great page turner. The authors Mike and Jocelyn each have their unique ability to share their trip with all the highs and lows. The two cyclists encountered several major obstacles. Rather than giving up they made the best of it and continued on and succeeded. Many parents wish they could reconnect with their adult children and attempt a journey like they have done. These cyclists went out and DID IT! Mike has a pleasant tempo to his writing that makes this an enjoyable read. At first, the idea of reading a 252 page book about cycling seemed pretty boring to me. That assumption was proven wrong very quickly. The authors each have a unique voice and perspective on life that warms the soul (so do the lovely and helpful people they meet with along the way!). The pace of the writing is entertaining, informative, and at times, a drama like no other. This is an inspiring life philosophy that the world’s population lacks dearly in this digital age where we think that we can see the world through a computer screen or TV.. The authors didn’t just stop after completing the trip across the USA either. 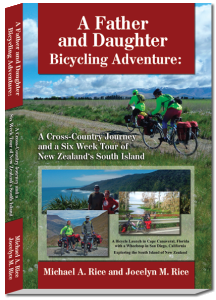 The book includes their international trip across New Zealand! Their next trip is around the world… How many people do you know who are addicted to exploring? Maybe you are one of them….give this book a read if you are curious. This book will inspire you to travel and live life to the fullest. The bond between father and daughter is incredible. Very well written book! I felt like I was on the trip with them. Great father daughter relationship. Enjoyed the father’s and daughter’s perspectives of the trip. What a magnificent adventure between a father and daughter! Well written and with black and white photos to support their triumphs and tribulations! I would have bought this book from Amazon.com, but my friend Mike Rice sent me an autographed copy. Mike and Jocelyn did a very good job of writing this book about their fantastic bike riding adventures. Besides knowing Mike personally, many of the places that are mentioned in the book, both in Texas and in New Zealand, are places that I have been, so I could directly relate. Without appearing to be boasting, the stories in the book are candid and honest, and very enlightening as to life on the road. Had I not known Mike, I probably would have not bought the book, since bike riding is something that I very seldom do any more. But it would have been my loss! This is a treasure chest; stay tuned for the sequel after (or during) Mike’s and Jocelyn’s next big trip of riding around the world. While I don’t have the desire to do that myself, it will be difficult for me to wait for the next book. Thank you Andee. Couldn’t do this without you and Cary. But I don’t know why you came up as Anonymous. Thank you to all of the readers who have left their captivating comments! I am living the other part of the adventurers’ dream, and sometimes wish I could take a trip from the everyday life of a teacher/librarian! I enjoy the cooler days in Florida and know that my cyclists are back in the tropics cycling south almost to Panama. Check out the recent pictures and Mike’s blog! Keep those happy thoughts and prayers for all travelers, near and far! Thank you so much for sending me a few free copies of your book to share with my coworkers. Evelyn Velazquez – B&N, Small Press Dept.